Andre Burakovsky celebrates after scoring the game’s only goal. Image courtesy of Monumental Network. Preseason games generally don’t mean much, at least not in the standings, but the opportunity to play in one can have a tremendous effect on a young player’s confidence. 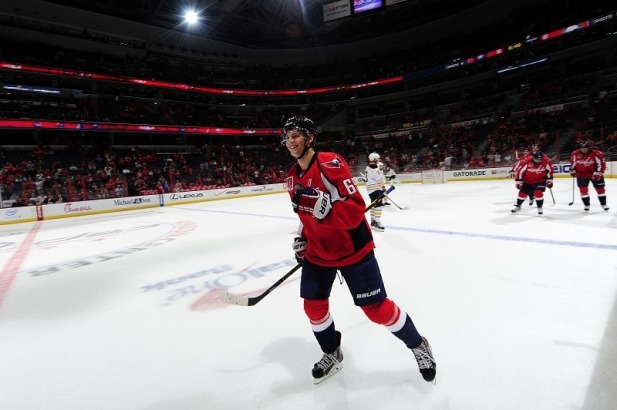 In Sunday’s exhibition versus the Buffalo Sabres — which the Washington Capitals won 1-0 — Andre Burakovsky, the Caps’ 2013 first round draft pick, scored the game’s only goal on his first shot. Jason Chimera, one of Burakovsky’s linemates for the day, dished it to the rookie, who sent a wrister past Sabres goalie Nathan Lieuwen. Rookie goalie Pheonix Copley played the first period of the game before being replaced by Braden Holtby for the remainder of the game. For Copley, just being there was an honor. Copley stopped all 6 shots faced in the first period. The Capitals also made a few aesthetic changes to their locker room for the 2014-15 season. A Capitals “weagle” logo was added to the middle of the room, roped off, and all media were advised to not step on the logo. Locker stalls were refurbished to a sleek, dark wood finish. Barry Trotz told reporters that the logo is meant to represent organizational pride- something he’s spoken about frequently during the beginnings of training camp. “I think there’s a pride that we should have in our organization. It’s about what’s on the front of the jersey, not what’s on the back of the jersey. What’s on the front of the jersey is very important and should be a little bit sacred,” he said. Technically, the “weagle” logo is present on each shoulder of the Capitals jersey, but the message still rings true.